The People’s Republic of China has, in the past few years, carried out a rapid ascent in business and development terms, and is receiving a growing importance in world politics and the world economy. Measured by gross national product, the country has the second-largest national economy in the world after the USA. China is the growth engine of the East Asian region, offering, as a “gate to the East,” long-term business and economic prospects. High sums of both domestic and international investment capital strengthen the positive development, ensuring that China remains the growth market of the future — with Shanghai as its business centre. The liberalisation of the Chinese market is, with regard to this, an important cornerstone of China’s national economic policies. The development of Pudong and, in particular, the fostering of special zones like that of the Zhangjiang Hi-Tech Park play a leading role in the opening up of the largest national economy in the world, holding gigantic opportunities for globally-active corporations as well as for internationally-oriented medium-sized companies. 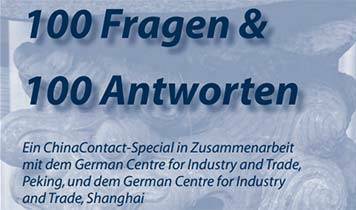 In cooperation with the European Chamber of Commerce in Bejing, China, the periodical ChinaContact has created a special edition which deals with the 100 most frequently asked questions and answers about China.